Netsounds is teaming up with Belladrum and Ironworks to whet everyone’s appetite with a Bella Fringe Showcase! As well as an awesome line-up of emerging musical talent from the Inverness area, there will also be a chance to win a pair of tickets to Belladrum 2018. 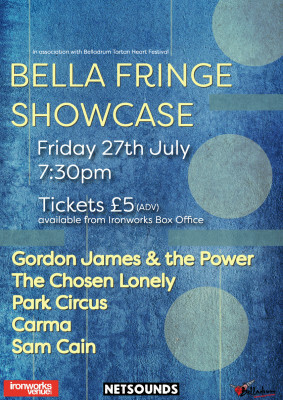 The live music showcase on Friday 27th July will feature Carma, Park Circus, Sam Cain, The Chosen Lonely and Gordon James and the Power all playing on the Ironworks stage a week before Belladrum. On the night there will be a giant raffle where tickets will be sold for £1 with the chance to win a pair of tickets to Belladrum 2018. The raffle will raise money for Belladrum’s lead local charity, Lovat Shinty Club, who are raising funds to build a new pavilion to replace their 40-year-old club house.